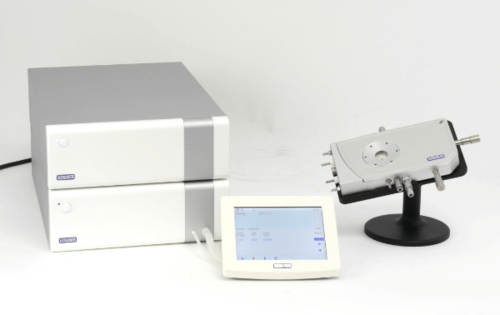 The LTS420 hotstages are optimised for isothermal sample analysis applications where high speed heating and cooling are compromised by larger sample area with excellent thermal stability of less than 0.1°C. The LTS420 is an easy to use, versatile heating and freezing stage. The stage consists of a large area temperature controlled element with a platinum resistor sensor embedded close to the surface for accurate temperature measurements in the range of -196 to 420°C (when used with LNP95 cooling pump). The sample is simply mounted on a standard microscope slide in direct contact with the heating element and can be manipulated 15mm in X and Y direction. The sample chamber is gas tight and has gas valves to purge with either inert gas or humidity. This stage is also available with internal electrical connections and probes.